his life and work, as Professor Myra Young Armstead (far left) looks on. Bard students, staff, and faculty gathered for a Commemoration Walk on the afternoon of Monday, December 3, visiting new signage around campus designed to encourage critical reflection on Bard’s history. This is a project of students in Professor Myra Young Armstead’s Inclusion at Bard course, part of a series of Engaged Liberal Arts and Sciences courses at Bard, sponsored by the Center for Civic Engagement. The new placards on campus engage community practices of public memory, recognition, and forgetting. 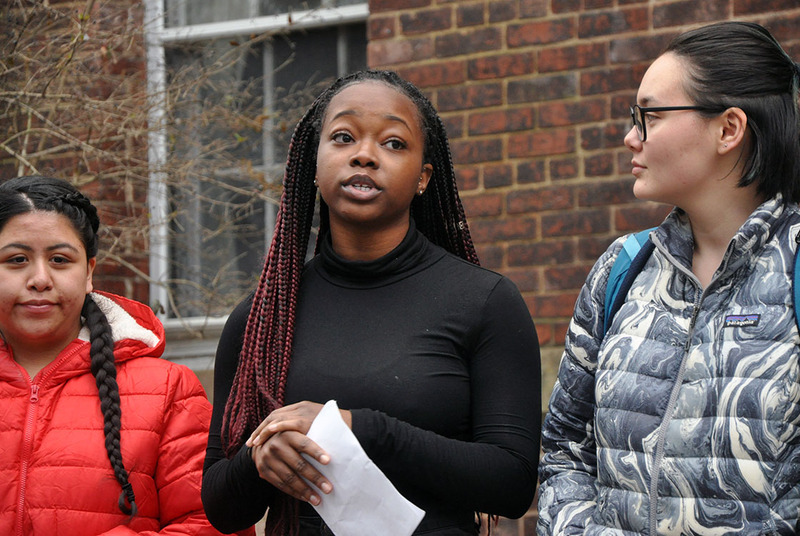 Students in Professor Armstead’s Inclusion at Bard course speak at the historical marker dedicated to John Aspinwall. A ribbon-cutting ceremony was held at each location, with a historical presentation by students and remarks by a member of the faculty. Professor Armstead kicked off the event at the marker outside Aspinwall Hall highlighting John Lloyd Aspinwall, an early benefactor of St. Stephen’s College, Bard’s first incarnation. Like many antebellum donors to the nation’s colleges and universities, Aspinwall owed a significant portion of his wealth to commercial ventures that profited from slavery in the Americas. 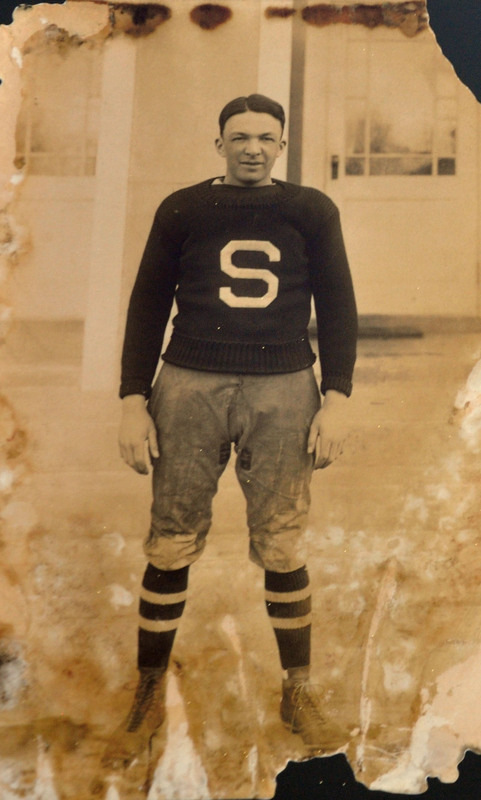 Vine Deloria Sr., Class of 1926. A second placard near the library, overlooking Kline with a view of the Catskills, is dedicated to Vine Deloria Sr., Class of 1926. Deloria was an exceptional athlete at St. Stephen’s whose life and work were defined by a proud Native American cross-culturalism. He became the Episcopal archdeacon of Indian parishes in South Dakota and a vocal advocate for tribal governments. 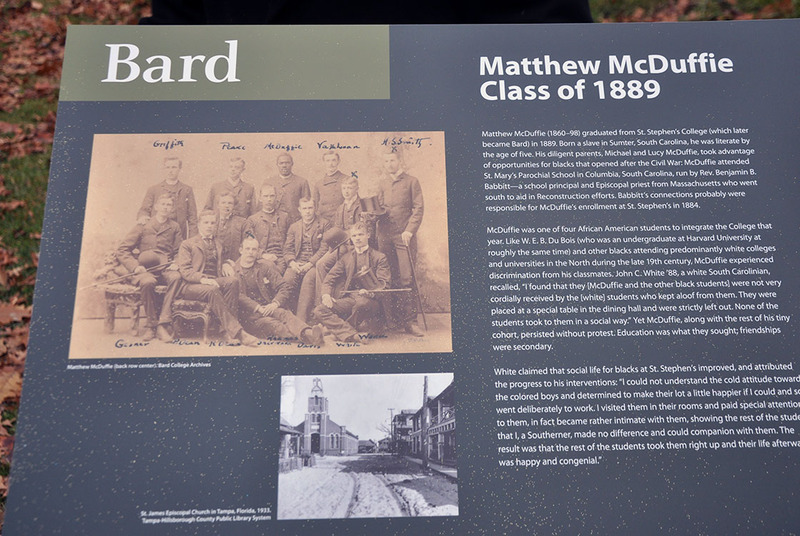 Historical marker near the Bard Chapel honoring Matthew McDuffie, Class of 1889. A third placard near the Chapel of the Holy Innocents honors Matthew McDuffie, Class of 1889. Born a slave in South Carolina, he was literate by the age of five. Thanks to the efforts of his diligent parents, McDuffie was able to take advantage of opportunities for blacks that opened after the Civil War. He was one of a cohort of four African American students to integrate St. Stephen’s in 1884. McDuffie experienced discrimination from his classmates but he persisted in his education without protest, and went on to become the first resident priest of St. James Episcopal Church in Tampa, Florida.